"Gaussian Curve" redirects here. For the band, see Gaussian Curve (band). for arbitrary real constants a, b and non zero c. It is named after the mathematician Carl Friedrich Gauss. 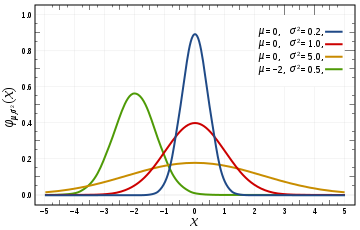 The graph of a Gaussian is a characteristic symmetric "bell curve" shape. The parameter a is the height of the curve's peak, b is the position of the center of the peak and c (the standard deviation, sometimes called the Gaussian RMS width) controls the width of the "bell". 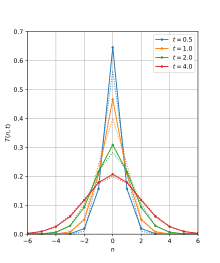 Gaussian functions are widely used in statistics to describe the normal distributions, in signal processing to define Gaussian filters, in image processing where two-dimensional Gaussians are used for Gaussian blurs, and in mathematics to solve heat equations and diffusion equations and to define the Weierstrass transform. Gaussian functions arise by composing the exponential function with a concave quadratic function. The Gaussian functions are thus those functions whose logarithm is a concave quadratic function. Alternatively, the parameter c can be interpreted by saying that the two inflection points of the function occur at x = b − c and x = b + c.
Gaussian functions are analytic, and their limit as x → ∞ is 0 (for the above case of b = 0). These Gaussians are plotted in the accompanying figure. , b = μ and c = σ.
Gaussian functions centered at zero minimize the Fourier uncertainty principle.
. The product of two Gaussian probability density functions, though, is not in general a Gaussian PDF. are kept fixed by the Fourier transform (they are eigenfunctions of the Fourier transform with eigenvalue 1). A physical realization is that of the diffraction pattern: for example, a photographic slide whose transmittance has a Gaussian variation is also a Gaussian function. where f must be strictly positive for the integral to converge. for some real constants a, b, c > 0 can be calculated by putting it into the form of a Gaussian integral. First, the constant a can simply be factored out of the integral. Next, the variable of integration is changed from x to y = x - b. In two dimensions, the power to which e is raised in the Gaussian function is any negative-definite quadratic form. Consequently, the level sets of the Gaussian will always be ellipses. Here the coefficient A is the amplitude, xo,yo is the center and σx, σy are the x and y spreads of the blob. The figure on the right was created using A = 1, xo = 0, yo = 0, σx = σy = 1. Using this formulation, the figure on the right can be created using A = 1, (xo, yo) = (0, 0), a = c = 1/2, b = 0. For the general form of the equation the coefficient A is the height of the peak and (xo, yo) is the center of the blob. Such functions are often used in image processing and in computational models of visual system function—see the articles on scale space and affine shn. Also see multivariate normal distribution. for a 2D Gaussian function. The most common method for estimating the profile parameters is to take the logarithm of the data and fit a parabola to the resulting data set. While this provides a simple least squares fitting procedure, the resulting algorithm is biased by excessively weighting small data values, and this can produce large errors in the profile estimate. One can partially compensate for this through weighted least squares estimation, in which the small data values are given small weights, but this too can be biased by allowing the tail of the Gaussian to dominate the fit. In order to remove the bias, one can instead use an iterative procedure in which the weights are updated at each iteration (see Iteratively reweighted least squares). Once one has an algorithm for estimating the Gaussian function parameters, it is also important to know how accurate those estimates are. While an estimation algorithm can provide numerical estimates for the variance of each parameter (i.e. the variance of the estimated height, position, and width of the function), one can use Cramér–Rao bound theory to obtain an analytical expression for the lower bound on the parameter variances, given some assumptions about the data. The noise in the measured profile is either i.i.d. Gaussian, or the noise is Poisson-distributed. The spacing between each sampling (i.e. the distance between pixels measuring the data) is uniform. The peak is "well-sampled", so that less than 10% of the area or volume under the peak (area if a 1D Gaussian, volume if a 2D Gaussian) lies outside the measurement region. The width of the peak is much larger than the distance between sample locations (i.e. the detector pixels must be at least 5 times smaller than the Gaussian FWHM). where the individual parameter variances are given by the diagonal elements of the covariance matrix. One may ask for a discrete analog to the Gaussian; this is necessary in discrete applications, particularly digital signal processing. A simple answer is to sample the continuous Gaussian, yielding the sampled Gaussian kernel. However, this discrete function does not have the discrete analogs of the properties of the continuous function, and can lead to undesired effects, as described in the article scale space implementation. denotes the modified Bessel functions of integer order. This is the discrete analog of the continuous Gaussian in that it is the solution to the discrete diffusion equation (discrete space, continuous time), just as the continuous Gaussian is the solution to the continuous diffusion equation. In statistics and probability theory, Gaussian functions appear as the density function of the normal distribution, which is a limiting probability distribution of complicated sums, according to the central limit theorem. Gaussian functions are the Green's function for the (homogeneous and isotropic) diffusion equation (and to the heat equation, which is the same thing), a partial differential equation that describes the time evolution of a mass-density under diffusion. Specifically, if the mass-density at time t=0 is given by a Dirac delta, which essentially means that the mass is initially concentrated in a single point, then the mass-distribution at time t will be given by a Gaussian function, with the parameter a being linearly related to 1/√t and c being linearly related to √t; this time-varying Gaussian is described by the heat kernel. More generally, if the initial mass-density is φ(x), then the mass-density at later times is obtained by taking the convolution of φ with a Gaussian function. The convolution of a function with a Gaussian is also known as a Weierstrass transform. A Gaussian function is the wave function of the ground state of the quantum harmonic oscillator. The molecular orbitals used in computational chemistry can be linear combinations of Gaussian functions called Gaussian orbitals (see also basis set (chemistry)). Mathematically, the derivatives of the Gaussian function can be represented using Hermite functions. The n-th derivative of the Gaussian is the Gaussian function itself multiplied by the n-th Hermite polynomial, up to scale. Consequently, Gaussian functions are also associated with the vacuum state in quantum field theory. Gaussian beams are used in optical systems, microwave systems and lasers. In scale space representation, Gaussian functions are used as smoothing kernels for generating multi-scale representations in computer vision and image processing. Specifically, derivatives of Gaussians (Hermite functions) are used as a basis for defining a large number of types of visual operations. Gaussian functions are used to define some types of artificial neural networks. In fluorescence microscopy a 2D Gaussian function is used to approximate the Airy disk, describing the intensity distribution produced by a point source. In signal processing they serve to define Gaussian filters, such as in image processing where 2D Gaussians are used for Gaussian blurs. In digital signal processing, one uses a discrete Gaussian kernel, which may be defined by sampling a Gaussian, or in a different way. In geostatistics they have been used for understanding the variability between the patterns of a complex training image. They are used with kernel methods to cluster the patterns in the feature space. ^ Weisstein, Eric W. "Fourier Transform – Gaussian". MathWorld. Retrieved 19 December 2013. ^ Parent, A., M. Morin, and P. Lavigne. "Propagation of super-Gaussian field distributions." Optical and quantum electronics 24.9 (1992): S1071-S1079. ^ "GLAD optical software commands manual, Entry on GAUSSIAN command" (PDF). Applied Optics Research. 2016-12-15. ^ a b Hongwei Guo, "A simple algorithm for fitting a Gaussian function," IEEE Sign. Proc. Mag. 28(9): 134-137 (2011). ^ Lindeberg, T., "Scale-space for discrete signals," PAMI(12), No. 3, March 1990, pp. 234–254. ^ Campbell, J, 2007, The SMM model as a boundary value problem using the discrete diffusion equation, Theor Popul Biol. 2007 Dec;72(4):539–46. "Integrating The Bell Curve". MathPages.com. Code for fitting Gaussians in ImageJ and Fiji.